"Playing is when grown ups stop telling me what to do"
What’s this round and prickly ball? Under the leaves beside the wall…. 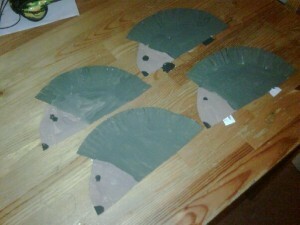 It’s a family of hedgehogs who are about to move under our Autumn tree. 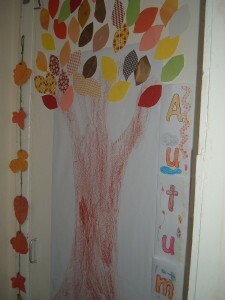 It’s coming along really nicely, the tree’s leaves are made from different papers and materials we discovered in the craft box, the banner was coloured in and decorated by the children, and yesterday we experimented with mixing different amounts of yellow and red to get a range of beautiful shades of orange for the leafy garland. Next week we are going to make some woodland animals to live around the bottom of the tree. This week we have been learning about harvesting crops, and celebrating the Harvest Festival. 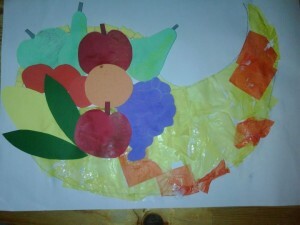 At the beginning of the week we made some lovely pictures of Cornucopias and filled them with lots of fruit, cut out from different materials we had in the craft box. Here are the empty horns, waiting to be filled with fruit. 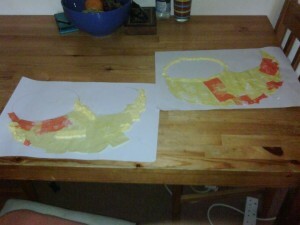 And here are the finished articles. On Wednesday we were very busy, we made cupcakes to celebrate National Cupcake Week however they didn’t hang around long enough to have their photo taken. 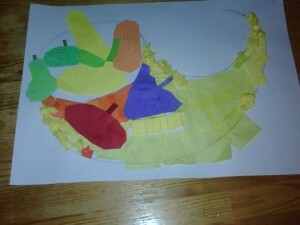 Then we made and decorated paper cones to be filled with all sorts of goodies, our very own mini cornucopias. 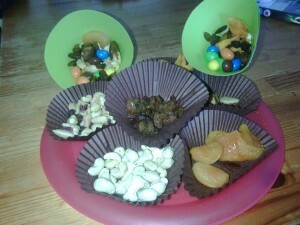 Here you can see muffin cases with all the yummy snacks, and the two green cones half full, in the background. We snuck some peanut M&Ms in amongst all the healthy treats. 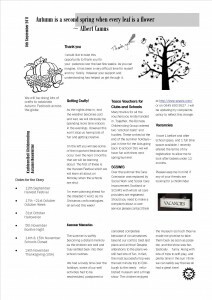 After my IT Manager (my husband) worked his magic WordPress is playing nicely again and I can share my Autumn newsletter with you all. Well for a variety of reasons – busy summer holidays and a slight personal drama – I have neglected my poor little website somewhat. However, I am back and I hope never to leave my dear readers hanging again. So, the summer – well some folk disagree, but I think we were really lucky with the weather. I can only think of a handful of days when the weather was so bad we couldn’t leave the house, most of the time we were out and about, playing in the fresh air, or on a day trip. After several hours educating ourselves in the museum, and indulging ourselves in the gift shop, we took in a show at the Fringe. This was a little bit of a leap into the unknown, as it was a free children’s show by a performer I had never of before. Well was I delighted we had taken the leap. What a hoot! 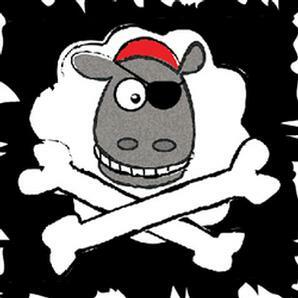 The kids LOVED Phil the Shepard, and Euan even got up on stage to play the part of a Zombie Sheep. We will be looking out for Phil at the fringe next year, and Santa may well be popping some of his books in some stockings this Christmas. Alas, the summer is over, and we are back in the well established routine of school runs and homework, the nights are drawing in and it’s getting chillier. Autumn is definitely here, and to mark that I have written my autumn newsletter, which outlines our activities for the next couple of months in the run up to (whisper it) Christmas…. However wordpress is misbehaving, so you will have to wait a little longer to see it! My aim is to provide a warm, welcoming care service within a homely and friendly environment. I live in a quiet, residential area of Ladywell, Livingston and offer wraparound care for Harrysmuir primary and Ladywell & Inveralmond nurseries. I hope you enjoy learning about my service, and I look forward to hearing from you. I have two full time, preschool spaces available for immediate start. Look what we’ve been doing!! Kathleen Bell Childminding is proudly powered by WordPress Entries (RSS) and Comments (RSS).